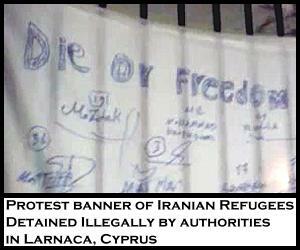 ICRIR: Illegal Detentions of Iranian Refugees in Cyprus: Break the Silence! The video clips presented here show the conditions inside of the prison in Larnaca where a number of Iranian refugees are illegally detained, and where several participated in a hunger strike last month, among other protest actions they have engaged in. 1- We demand the immediate release of Mr. Hossein Hossein-nejad Seresty (arc : 5506241) and his wife Mrs. Roghayeh Hossein Nezadeh (arc : 5506240) and their immediate unification with their 3-year-old child. [The couple’s child was illegally taken from them and given to a local Cypriot family]. Interviewer: Hi Nima. Can you tell us about yourself? Nima: I have been in this country for 9 years. They have put me in this jail for 7 months without giving me an answer about an interview. My wife and kids are somewhere out there. The conditions here are awful. We don’t get enough light or sunshine. Really horrible conditions. I don’t even want to talk about the food. Interviewer: Has any human rights organization or the UN contacted you so far? To offer help of any kind? Nima: No one has contacted me or has offered to help me. I have received no answers from human rights. Interviewer: What about you Mojtaba? What is your story? Mojtaba: I have been here [in Cyprus] about 8 years and a few months They arrested me and then they told me I had to leave the country. They went to my house and took all of my documents. These were my official documents against the Islamic Republic. I have asked for my papers but they won’t give me back my documents. I have been in detention for 11 months. I don’t see enough sunshine and the food is all beans and lentils, it is not good. And we can’t get an answer from anyone! Interviewer: Hi Ruhollah. What about you? Have you not broken your hunger strike yet? Can you talk? Interviewer: How many days has it been since you started [your hunger strike]? Ruhollah: It has been 9 days. Interviewer: 9 days! So can you talk? Or should I talk for you? Ruhollah: No, you talk for me. Interviewer: Our friend Ruhollah here has been here for 9 months. He was arrested after his first month here [in Cyprus] and he has been in Larnaca jail for 8 months now. He made his request for asylum here in jail. During these 8 months, he has received no answer to his asylum request. He was taken for an interview once, which was just a mock interview. It was not official, it was full of lies, and he received no papers. The International Coalition for the Rights of Iranian Refugees fully supports the demands of the detained Iranian asylum-seekers. Additionally, given recent statements by the Islamic Republic’s General Prosecutor Mohsen Eje’i and others clearly stating that anyone who files for political asylum will be prosecuted for propagating against the regime should they be returned to Iran, we also demand prima facie status for Iranian refugees. 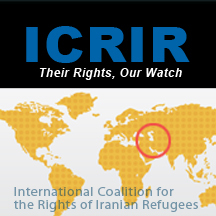 The ICRIR has called for protest actions against the crimes committed by the government of Cyprus against Iranian and other refugees in Cyprus during the week of May 8, 2011. An action for Washington DC is confirmed, and activists in Brussels and Berlin are also planning actions for that week. Activists in other cities who would like to participate are invited to submit their event information to Maria Rohaly (maria.rohaly@gmail.com); this information will be published and disseminated by ICRIR members and our extended activist network.